Don't worry, Joe Douglas isn't going anywhere. At least for now. Douglas, a former member of the Ravens' front office and current righthand man to Eagles general manager Howie Roseman as vice president of player personnel, has received high praise for the work he's done since arriving in Philadelphia from Baltimore, and rightfully so. Now, following a Super Bowl victory in February, there's a good chance you'll hear Douglas' name being thrown around as a potential candidate for any GM jobs that may open in the not-so-distant future. Mailbag: If you were to start a team today, who would be your top 10 quarterbacks? So when a press release from the Eagles with the subject line, "Philadelphia Eagles Announce Scouting Department Changes," landed in my inbox, Douglas' name was the first to come to mind. As it turns out, the news had to do with the righthand man's righthand man. Andy Weidl, who spent over a decade with Douglas in Baltimore before joining the Eagles in 2016 as assistant director of player personnel, will now have one less word in his official title. Weidl, the No. 3 man in the Eagles front office has been promoted to director of player personnel, the team announced on Monday. The move may have been made as a way to keep Weidl and his 20-plus years of experience on staff by making it more difficult for other teams to lure him away. Either way, it's a clear vote of confidence – and a possible indication that if Douglas were to be hired as a GM somewhere else, Roseman and the Eagles could promote Weidl again. Of course, that's assuming Douglas doesn't take his longtime colleague with him. The Eagles have also announced several other changes within their front office, most notably naming Jake Rosenberg as the team's vice president of football administration. Rosenberg, entering his seventh season with the team, had been serving as the director of football administration since 2014 and plays a hugely important role in managing the team's salary cap, as well as signings, player acquisitions, contract negotiation, and CBA compliance. 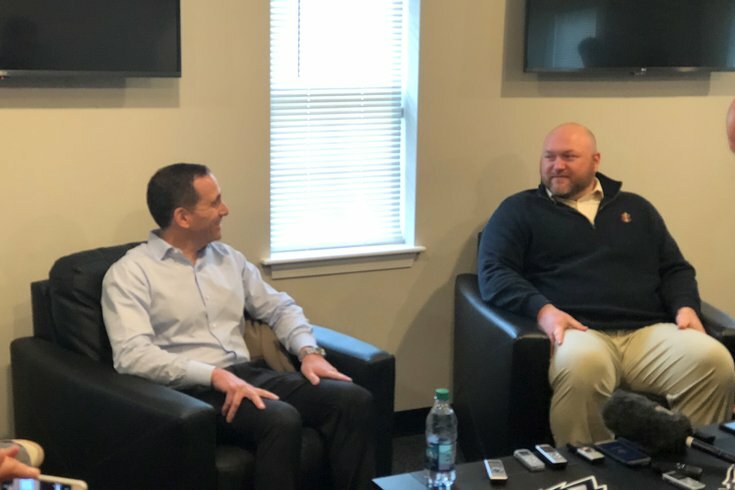 Basically, if Joe Douglas is Howie's righthand man – focusing on talent evaluation and scouting – then Rosenberg is his lefthand man, crunching the numbers and making sure everything fits on paper. Now, he has a title to match. Wolking, who enters his eighth season with the Eagles after working as the club’s Midwest Area Scout (2011-12) and Southeast Area Scout (2013-17), will now serve as the Assistant Director of College Scouting under Ian Cunningham. Heinlen spent 15 years with the Buffalo Bills (2001-16), including the final 14 as a College Area Scout. He played quarterback at North Central College in Naperville, IL, and went on to earn a master’s degree in Sports Administration from the University of Florida before beginning his career in the NFL. Stewart joins the Eagles after 11 seasons with the New England Patriots. He was originally hired by New England as a Scouting Assistant in 2007 and went on to serve as both an Area Scout (2009, 2013-17) and Pro Scout (2010-12). The Patriots won two Super Bowls (XLIX and LI) during Stewart’s tenure with the team. Prior to beginning his career with the Patriots, Stewart served as the Assistant Director of Football Operations at Temple University in 2006. Myers, who has been with the Eagles since 2013 in a variety of roles, will now serve as the team’s West Coast Area Scout; Ward, who was hired by the Eagles in 2017 as Midwest Area Scout, will shift to the Northeast in 2018. Weidl has served as the club’s College Scouting Coordinator since 2016 and will now work as Player Personnel Coordinator. DiValerio was hired by the club as a Scouting Assistant and joins the organization after working as a student assistant for the football team at Villanova University. Ferrari joined the Eagles in May 2016 as the club’s director of football compliance after spending the previous eight years at National Football League headquarters. Ryan has worked for the organization in a variety of roles since 2013 and has played a key role in team travel for the last two seasons. Ryan will now officially join the football operations department and will oversee all aspects of team travel and logistics.